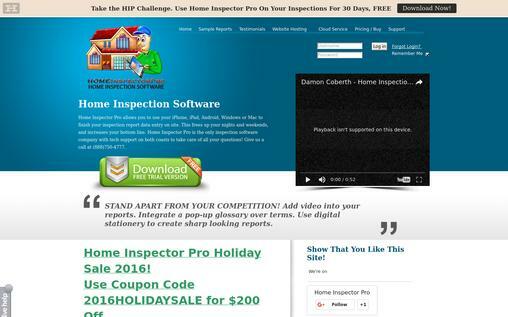 Home inspection software is a web based software which is designed to create home and property related inspection reports, technically provides PDF/HTML publishing. It is also available in tablets. It allows any inspector to create easy reports that can be quickly uploaded online also. One can upload images or videos in just one click. 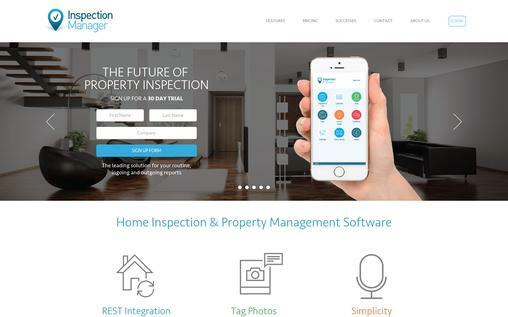 There are inspection apps also, for residential property management, student housing or building inspection companies. You’ll be getting the frequent request for house inspection if you can make people aware of your presence on the web. How would it be possible? Yes, it is via MailGet Bolt – An effective & affordable email marketing software service. It has inbuilt invoices, sketch making, images, videos, report summary and many features like this. 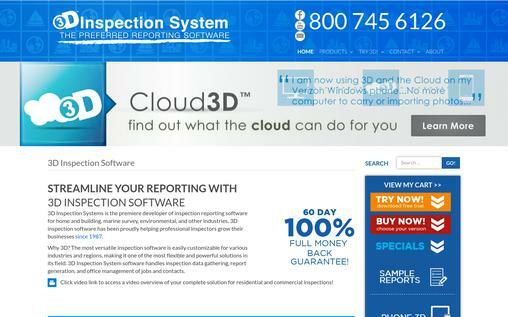 This software allows you to finish your inspection report data entry on the website. You can use it on your IPhone, IPad, android, windows or Mac completes the reports. You can just switch on to this software if meeting your deadlines is difficult for you. You can add videos to your reports and it’s very simple. Also, it excels where you can use digital stationary and you can create sharp looking reports. 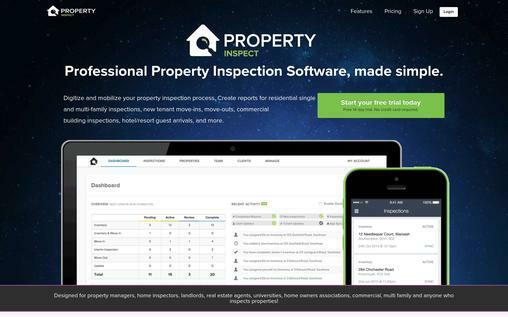 With this commercial inspection software, you will be easily able to compete with larger inspector corporations. It is currently being used in 19 countries and 9 different languages. It has a feature of easily creating a template for every type of inspection you perform. It allows you to upload reports and email a link to the report in one easy step. It reorders pages, controls page breaks and create coloured borders. This software treats you with free 30 days trial and free webinars for your work. You can create clear, illustrated and highly professional reports. 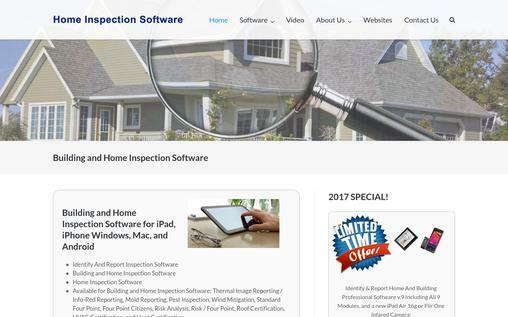 It provides you with immediate access to everything that you need to create during outstanding home inspection report that differentiate you from the competition. It has 1700 different colour illustrations where you can also add images or videos that can also be edited according to your requirement. This makes you create amazing and high quality reports. Also, provides very quick reports. It is very easy to use and understand. You can simply write your reports whether online or offline on your desktop, laptops or mobiles. With a familiar work with this software, it is guaranteed that you write great looking Horizon report in less thanan hour. 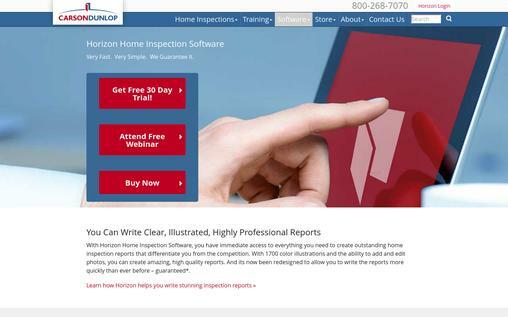 HomeGauge 5 is the most advanced launched home inspection software as yet. It is designed for your style, either on your PC, laptop or mobile phone. This software aims at saving time and providing reports efficiently. You can directly take photos in your device. You can couple it up with your custom comment library wherever you want them to locate in your report. 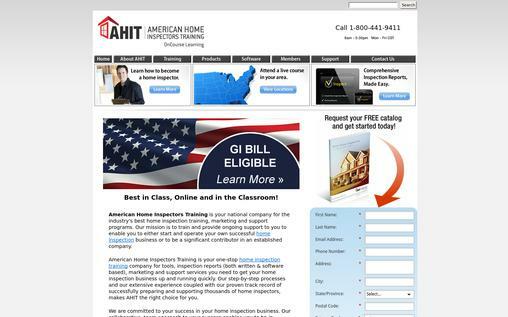 It uses templates for producing reports for residential, commercial, multi-family, safety, state pest form etc. You can also create your own templates, where some of the templates are free of cost. Also, produces illustrated quotes to write up for repairs or remodelling. Once you purchase EZ inspection software, you can create unlimited printed and electronic reports that can be emailed to client. There is no monthly fee and the program never expires. You can install this software on multiple desktops for a single low price. Clients love summary pages that simply sum up the report in just one page, and this software excels at it. The summary page can also be removed as per your choice. 3D home inspection software excels at streamlining your reports for home and building, marine survey, environment and other industry. It is helping people grow their business since 1987. It provides with a cloud on your laptop and mobile so that you don’t have to carry the desktop everywhere. This is very versatile software and is easily customisable for various countries and regions making it more powerful and flexible solutions in its field. This software handles data inspection gathering, report generation and office management for jobs and contracts. It has innovative single screen and easy to use interface. You don’t just get trapped in the windows. It is a very flexible and customizable product. 3D inspection software is one of the oldest software in the industry and still the best. It has real collaboration with inspectors so they understand the industry better. Inspection Manager is the only mobile app that is designed to integrate with professional accounting system. It allows you to easily add photos and images to the document condition of any property. You can also use your mobile app to take a snap of the document and then simply tap to comment and save. Also you can tag the area through the picture.It has personal phrase bank pre voice- recognition software in which you can speak into your device and watch the words appear on the screen. Also, view tenant details onsite to greet them with confidence. You can also call them or text them using this app. You can customize the layout with unique form names. It has a swipe option to delete unnecessary data. It is the easiest reporting application that can be used in market today, with a user-interface that is simple. It maximizes your time. It was designed by IT professionals to make your job easier and your business more successful. You spend less time with writing reports with this tool and more time growing your business. It helps you in creating inspection reports immediately. It has no subscriptions or per-use fee. It customizes report templates to match your business and the type of inspection. It instantly generates Reports and you can send the PDF email from your device at the same time. It provides unlimited support and a free 7 day trial. It is fully compatible with android and iPad. 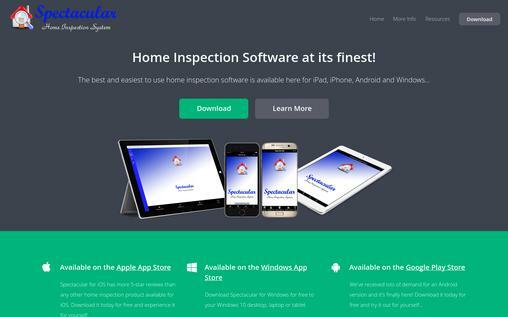 The best and easiest to use home inspection system which is compatible for iPad, iPhone, android and windows.It is available on apple store, windows app store and even Google play store. No other home inspection system provides images and videos better than spectacular. With just one button camera access and professional style photo editing tools, there’s no way you would spend hours on tools for inspection. Inspectacular, a companion app for agents and buyers, allows you to share comments and photos with the agents and buyers. They can follow you using their mobile instead of following you physically. It specializes in residential and commercial inspection software. It is a simple, comprehensive and easy-to-use interface and building inspection software package. Written use for windows, MAC, desktops, iPad and mobile phones. It identifies and reports professional. It also provides you with free test drive through the software. Clients love summary pages that simply sum up the report in just one page, and this software excels at it. The summary page can also be removed as per your choice. Digitize and mobilize your property inspection process. Create reports for residential single and multi-family inspections, new tenant move-ins, move-outs, commercial building inspections, hotel/report guest arrival and much more. It enables easier and faster inspection with detailed reporting. You don’t have to be a fast typist to get the report done quickly. The comment library feature allows you to insert comments instantly without having to type anything. The software is easy to use, affordable and fully customizable. You can directly log in from your desktop or mobile app to make your work simple and quick. 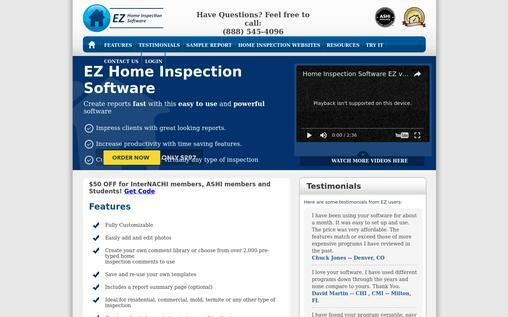 They have a web-based reporting system for home inspection. It not just makes the inspection easier, but also makes it faster. Some of the software is also combined with marketing support and business automation tools.